I made this in November, 2017 while Bitcoin was on the rise — and ledger wallets were becoming more well-known. When I first held a ledger wallet in my hand, I thought it was flimsy and needed a harder to case. I thought the case should be functional too, and it looked pocketknife-sized. This is a product line of pocketknives and Swiss Army knives with places to stick a hardware wallet. That way, your wallet is functional, because you can also take it on a camping trip. If I presell 1000 of these, I will manufacture it, but for now, it's hypothetical. I made an optical illusion of a cloud, that you can store things in. This sculpture motivates me to deal with my desk clutter, since if I put anything in this file folder, the illusion isn't as pretty. 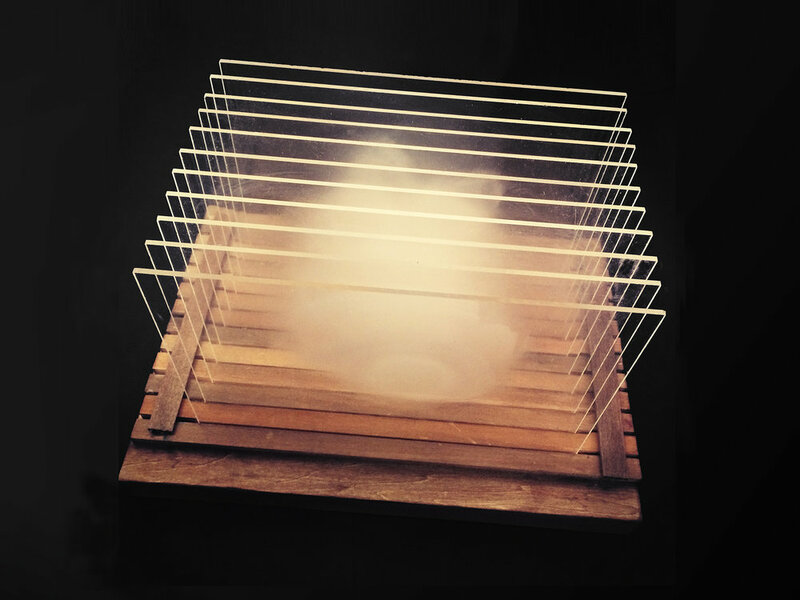 The cloud is made of planes of plexiglass and a slotted wooden base. These were given away as trophies for the Amazon Web Services Cloud Community Hero awards with the AWS logo, and are sold to people and companies globally. I sewed tiny sweaters for my friends' drones for Christmas and then made an online shop for drone sweaters, as though this was a common product (like a dog sweater). People are actually interested in this, because it does improve the battery life of the drone in cold climates, and makes drones look adorable. I made this for the Terrible Ideas Hackathon in San Francisco in 2017 — the idea is that you'd mail a giant cover letter (printed on a 6' sheet of durable paper, rolled up on a dowel rod) to ensure that your future employer will read your cover letter. Often people have resumes that require explanations, except many employers do not spend time reading the cover letters that are thoughtfully written. This really sends the point across to read it. It also would entirely cover a desk. I made a way to represent multiple company affiliations or a company that gets acquired. You really only need one hoodie to represent everything. I printed logos onto velcro patches that can attach to the corresponding piece of velcro sewn onto the hoodie. I made a working prototype for a fidget spinner that looks like a golden snitch. It spins pretty slowly, since it's made with real feathers. This is a dry erase compatible Expanding Brain Meme (aka Cosmic Brain Meme) to help you stay organized and prioritize your tasks. Attaches to whiteboards so you can keep testing out new words for the meme with your team. In awe of NASA's released image of the mysterious planet Pluto, I wanted to bring the experience of "seeing Pluto" off the computer screen and recreate the image in a more engaging and tangible way. 48" x 48". Hangs on a wooden rod.